Laser Tag Party | We're Mobile - We Bring The Party To You! Impress your family and friends with this awesome mobile laser tag gaming. Begin Your Laser Tag Party! 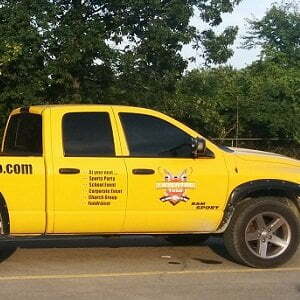 We are a fully mobile lazer tag company located in Niagara Falls, Ontario. We bring inflatable bunkers and our phaser system to your event such as a kids laser tag birthday party at your desired location. We offer packages for small, medium or large parties, three plans to choose from, as well as seven different in-game missions. Our plans include set-up, cleanup, and free delivery within 30 km of our headquarters. We also offer coloured lighting and music (weather permitting) for outdoor venues, as well as fog machines for indoors, venue permitting. Which Event Lazer, Archery, or Bazooka?